Pittsburgh Steelers vs New York Giants NFL Predictions & Week 2 NFL 2010 Picks: The Pittsburgh Steelers look to be a contender in the AFC for the 2010 AFC title, the Vegas odds makers currently lisy the Pittsburgh Sttelers with 10/1 NFL odds to win the AFC title. The Pittburgh Steelers are currently listed second to the Baltimore Ravens in the AFC North division with +275 NFL odds. With Ben Rothlesberger missing most of the first half of the NFL predictions season, will the Pittsburgh Steelers manage to hold on long enough for Rothlesberger to make his way back into the starting lineup? The Pittsburgh Steelers ended their 2009 NFL predictions season with a 9-7 record with wins over the Vikings, packers, Ravens, Titans, Chargers and Dolphins. Unfortunately for Steelers fans the Cincinnati Bengals were the Steelers biggest obstacle losing to the Bengals twice last season. The Steelers will once again face the Bengals in the 2010 NFL predictions season during weeks 9 and 14 of the 2010 NFL schedule. 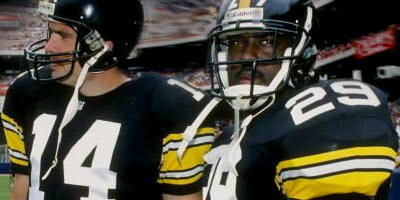 By then, the Steelers should be at 100% with Rothlesberger back in the starting lineup. Receiver Mike Wallace will be replacing Santonio Holmes and assuming he remains healthy until Rothelesbergers return, Wallace should have a significant impact on the Steelers offense. On defense the Steelers have troy Poamalu, Need I say more? Vegas-spreads.com recommends that you take advantage of the preseason NFL predictions bonuses available at SPORTSBOOK.COM . The NFL odds makers there are offering up a $250 Cash Bonus for you to bet the Steelers.